Jeep has been making 4×4’s since world war two, so they know what they’re doing. Their new Jeep Grand Cherokee SUV is alive with character. It’s a big and bold 4×4 by a trusted brand that comes with five seats, and a gigantic V8 engine. Easily one of the best to drive Jeeps ever, it’s also well equipped, and houses a roomy interior. It comes with advanced tech that ensures it’s King of the off-roaders, too. And because it shares part of its structure with a Mercedes, you just know it’s not going to let you down. OSV takes a closer look at what it’s all about with our 2017 Jeep Grand Cherokee SUV review. The Grand Cherokee isn’t what you’d call entertaining to drive. Instead, Jeep has put the focus on making it as comfortable as possible. It’s really easy to drive, too, thanks to powerful engines and light steering. Moreover, it comes paired up with an 8-speed automatic ‘box which shifts gears effortlessly in the background. Body lean will be a bit of an issue if you decide to go full pelt into corners. And if you decide to drive your Cherokee like a toy, your passengers might start to feel a tad dizzy. In terms of the engines, there isn’t a lot to choose from. The 3.0-litre diesel will be enough for most people, and can do 0-62 in 8.2 seconds. Your alternative is the 6.4-litre V8 petrol engine, which covers the same distance in 5.0 seconds. But you’d have to ask why you’d really need that kind of turn of pace for the extra cash you’ll be paying. That said, it offers a cackling engine note which we can’t get enough of. All models except the entry-level get air suspension, which we feel is necessary with this car. It cushions you from nasty bumps and lumps, and enhances your enjoyment on the road. Off-road, the Jeep Cherokee is highly capable. Remember, these are 4×4’s that made their debut some seventy years ago, so Jeep has had plenty of time to get them right. This one benefits from a five-mode off-road controller, which lets you dust the setup according to the terrain. It’s a clever piece of tech that ensures the Cherokee is just as good off-road as it is on it. If you want the best off-road experience, you’d need to splash out on the TrailHawk model. It adds Select-Speed-Control, which is a low-speed cruise control of sorts for when you’re off-road. Even better, the U-Connect infotainment system offers you key info on axle angle and engine oil pressure. The car was refreshed in 2013, which means it looks a lot better than it did. It’s more stylish outside, and more modern inside. The seats are now both supportive and comfortable, while the dashboard has been lifted from a scratchy plastic playground to a thing of almost premium quality. Not quite BMW or Audi, it’s certainly a whole lot slicker. The air suspension – available in all trims except the entry-level – improves the ride quality, and ensures all occupants are comfortable. With standard suspension, things are much shakier and less pleasant. Exterior noises are contained well, though the grumpy diesel engine will intrude. Interior space is good, and all five passengers will have enough space for their legs. There is no option of adding two extra seats, so in this sense, the Cherokee lacks a bit of versatility. However, there is plenty of storage space available. Door bins, cubbies and cupholders are all of a decent size. The boot, meanwhile, measures 782-litres, and comes with a large powered tailgate and a retractable load cover. This will prove useful whenever you need to hide your valuables. Drop the rear seats and you can expand the boot to some 1,554-litres. It’s such a big car that certain parking spaces will be out of bounds. But actually parking into a space that fits shouldn’t be an issue, and each model comes with a reversing camera. This is an impressively-equipped 4×4 that comes with power-adjustable leather seats and LED running lights. Whichever model you choose, you’ll also get 20” alloys, sat nav and a heated steering wheel. We can’t yet confirm how much the TrailHawk will cost, but it will probably be an unnecessary model for most buyers. However, it does come with the aforementioned advanced tech that enhances its off-road prowess. In terms of safety, Jeep will be disappointed that the Cherokee only scored 4/5 when it was crash-tested by Euro NCAP. It scored 69% for child occupant safety, which is okay. But 45% for pedestrian protection is less than average. Prices for the new car start out from £47,500 and rise to £72,800. For more information on our lease deals, check out our page here. The Jeep Grand Cherokee comes with two engines that are poles apart when it comes to the economy. Indeed, they’re like two different cars. Whereas the 3.0-litre diesel engine returns a respectable 40.4mpg, the V8 petrol averages just 20.9mpg. It also costs £515 a year to tax, with these figures matching those normally associated with supercars. And while the diesel’s economy is respectable, it’s miles off the best in this class. It’s a good thing the sole diesel is a 3.0-litre engine that’s paired with an 8-speed automatic ‘box and can do 0-62 in 8.2 seconds. Because the only alternative is an insanely expensive V8 petrol engine. It looks like a serious off-roader that means business. It’s a genuine force to be reckoned with off-road and won’t let you down off the beaten track. Exterior noises are contained well, though the noisy diesel engine will intrude. This is a shame, because it’s destined to be the most popular engine by a mile. You’re only alternative is the expensive V8 petrol. Most rivals have such an option. 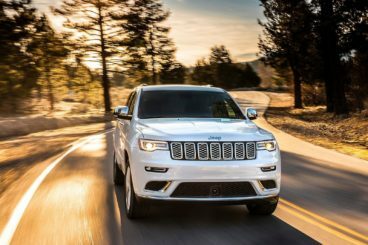 Let’s see how the car fares against its rivals in the comparison section of our Jeep Grand Cherokee SUV review. The new Volkswagen Touareg is a solidly built, handsome 4×4 that actually looks deceiving. Don’t let its slick aesthetics and gorgeous interior fool you – this is a serious off-roader. It’s based Porsche’s Cayenne, so the Touareg has credentials already. However, it doesn’t offer the same high-octane driving experience. That’s not exactly a bad thing, though. 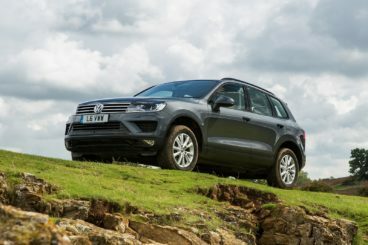 The Touareg has lots of grip, which means it’s composed in bends. Its 8-speed automatic transmission is smooth. And four-wheel-drive is standard across the range. Like the Jeep, engine choice is limited. There is only one diesel engine available – a 3.0-litre unit, though it comes in two power guises. The 201bhp variant does 0-62 in 8.7 seconds, while the 262bhp variant does it in 7.3 seconds. We like both engines. Whichever you choose, you’ll find they’re suitable for what you need them to do. This is just as well as, there are no petrol or hybrid models to choose from. A lack of choice certainly makes shopping easier. It also means that economy is decent across the board. The 201bhp diesel reruns 42.3mpg, while the bigger variant returns 41.5mpg. There’s barely a difference in emissions either, with the smaller engine emitting 173g/km of CO2, and the bigger emitting 180. Step inside, and you’ll be greeted by a well-built cabin. This is a fairly expensive model, so you can expect some real touches of luxury, with the leather trims a highlight. All models get a reversing camera too, as well as cruise control and climate control. Everything on the dashboard is well laid out, but our only criticism is that the cabin looks dated. Still, insertion is good and the seats are super comfortable. Furthermore, practicality is excellent. Visibility is fantastic, and thanks to the reversing camera and parking sensors, parking should be a piece of cake. There is a good amount of interior space, but not all five occupants will be equally comfortable. Anyone sat in the middle rear will have to deal with the transmission tunnel and a raised seat. It’s awkward back there. There are plenty of handy storage areas, such as a big glovebox. And we like the versatility of the back seats, which slide back and forth with ease. They also recline. At the touch of a button, they also drop down. Doing so increases the boot capacity to 1,642-litres from 580. The load lip is low, which boosts usability. 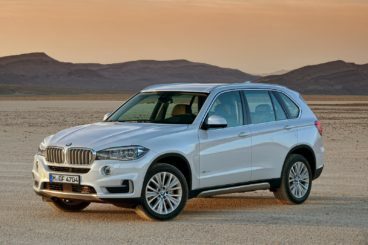 The new BMW X5 is the premium choice among these three SUV’s. The original was, in fact, the first SUV to offer proper driver engagement. It still makes you feel involved – but so do rivals now. Lighter but still tipping the scales at 2,070kg, the X5 manages to feel lithe on twisting roads. Body control is good, although the steering feels vague and artificial. Worse still, it’s not much use off-road. In this regard, the Cherokee is much better. The BMW has more engines to choose from, though. A 2.0-litre 228bhp will be enough for most buyers, with its four cylinders and 0-62 time of 7.7 seconds. But for a tougher X5, the 3.0-litre diesel adds two more cylinders and is available in 3 separate power guises. You’re spoiled for choice, and the most powerful version – 375bhp – can do 0-62 in 5.3 seconds. If, however, you’re feeling naughty, the more expensive 4.4-litre twin turbo V8 petrol engine is available. Powerful, muscular and full of performance, it can do 0-62 in 4.9 seconds. There is also the option of a plug-in hybrid that combines an electric motor with a 2.0-litre petrol engine. It does 0-62 in 6.8 seconds and can return 78mpg economy. That makes it the cheapest to run out of all models in this review. However, the diesels are more popular with buyers, and the basic 25d model returns 53.5mpg economy. Add four-wheel-drive, and that figure drops to 50.4mpg. That’s still way more affordable than the Jeep. The xDrive40d diesel is more powerful, and returns a respectable 47.1mpg. Meanwhile, the massive V8 petrol engine averages 29.4mpg. Inside, the BMW X5 SUV has been given a makeover. It’s a much classier affair than last time and can boast a solidly built cabin. The dashboard is visually compelling and comes with a huge 10” HD infotainment screen. BMW’s popular iDrive control system is standard, while a touch-sensitive pad makes simple tasks easy to execute. Unlike the Jeep, the BMW can be specified with seven seats. Adding the extra seats will cost you £1,400. Headroom is good, although adding the panoramic sunroof will reduce it a tad. 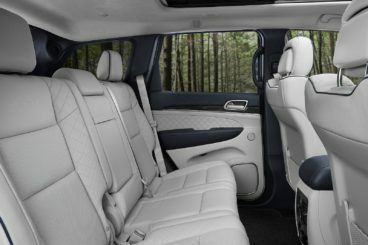 The leather seats are super comfortable, and the middle rear passenger should have no problems thanks to the lack of a transmission tunnel. The boot measures 650-litres with all seats up. This makes it smaller than the Jeep, although you can extend the capacity to 1,870-litres by folding the rear seats. If you opt for the hybrid model, luggage space is cut back to 500-litres. The American’s are good at delivering big, powerful 4×4’s that are confident off-road. But where they traditionally fall down is when it comes to fit and finish, and economy. That’s the case here. The new car has plenty of raw performance and excellent off-road ability. But it can’t match its European rivals when it comes to interior quality, and it’s not cheap to run. It is a Jeep, though, and can be relied upon when you want to go on an adventure. So, saddle up partner, because the new Jeep Grand Cherokee SUV will take you on a wild ride.